Chrome, Edge, Firefox, Internet Explorer, and Opera all render the Web, but each has gone its own way in terms of its interface, plugin strategy, performance, and more. 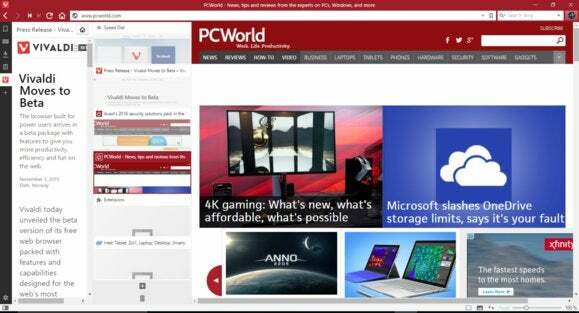 Now a new browser targeting power users has blurred the lines: Vivaldi, which puts a feature-packed, Opera-like interface on top of Chromium's open-source platform. Vivaldi has been available for some time as a technical preview, and the company claims that 2 million people or so have downloaded it. On Tuesday, the Vivaldi browser was released as a beta—still lacking some features, but with enough spit and polish for anyone to use. Vivaldi is led by former Opera chief executive Jon von Tetzchner, and Opera’s influence is clearly apparent. By default, “tabs” fall into a vertical window along the left hand of the screen, and there’s room for a pair of “sidebars” with notes and a future implementation of Vivaldi Mail. There isn’t quite the robustness of Opera—I like the dedicated Techmeme sidebar, which hasn’t made it to Vivaldi—but you can also add a narrow Web page, or a Web app, by clicking the “+” icon along the left-hand rail. 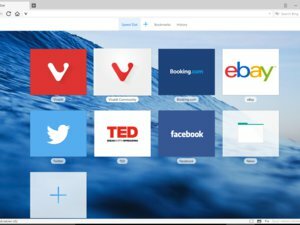 Open a new tab, and Vivaldi will show you a “speed dial” of popular tabs. Tabs can be stacked, grouped, and pinned. 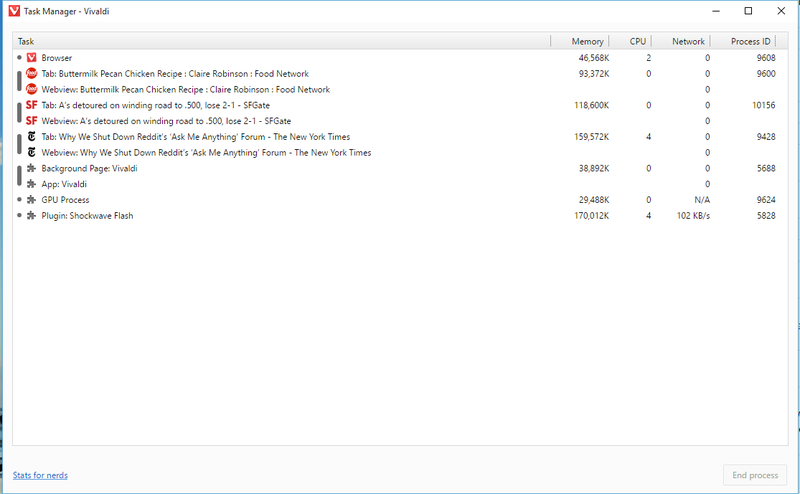 A slightly earlier version of Vivaldi shows memory usage on par with Chrome, from our earlier tests. But again, this isn’t a final build, and Flash was also loaded. Underneath it all, however, is the Chromium open-source browser technology, which Google releases to the public and uses as the basis for its own Chrome browser. The technical preview supports Chromium plugins—a PDF viewer, for example—and some extensions. (To access all of these, click the tiny “V” logo in the upper-left-hand-corner of the browser, which serves as a menu.) Vivaldi also supports Chromium extensions; adding these simply takes you to the Chromium extensions page to add integrated support for Microsoft’s Office Online, Currently, uBlock, and more. Vivaldi also boasts an extensive list of keyboard commands and even mouse gestures, all of which are accessible in the Settings menu. In fact, that’s one of the things that Vivaldi boasts about: its configurability, allowing you to move address bars and tabs about your screen to suit the way you work. There’s a tiny Expedia ad icon in the upper right-hand-corner of the browser, but that’s the only obvious ad integration that I noticed. One of the few omissions that I noticed was a way to store your bookmarks and move them from device to device—but, again, this is only a beta. We haven’t done a full run-through of Vivaldi yet, but, since it’s free, it’s worth downloading. Check it out and let us know your impressions in the comments.